Hubert Wu is Pursuing Two Super Girls? Above: Hubert Wu and Heidi Lee are rumored lovers. A brokeback rumor between The Voice 2 <超級巨聲> star Hubert Wu (胡鴻鈞) and “Ardently Love” <酷愛> singer Hins Cheung (張敬軒) has been circulating for months, but Hong Kong’s Oriental Daily received a scoop that Hubert is actually interested in pursuing several members of the Hong Kong idol girl group, Super Girls. Hubert met the girls last year when he signed with Stars Shine Entertainment, the music producer of Super Girls. A source leaked that Hubert initially wanted to ask out Super Girl’s Yanny Chan (陳穎欣), but when Yanny threw hints at Hubert that she was already taken, Hubert immediately switched gears to pursue the group’s youngest member, Heidi Lee (李靜儀). Last month, Hubert threw a party for Heidi’s 22nd birthday. Hubert and Heidi also frequently send each other text messages. Heidi took some time off of her busy filming schedule to accept a phone interview yesterday. She did not feel as if Hubert is pursuing her, saying, “I don’t think so. We’re just friends.” Heidi then quickly terminated the interview, expressing that she needed to return to filming. Heidi is currently filming romantic idol drama Lonely Fifteen 2013 <o靚妹仔之微交少女>, a remake of the 1989 film of the same name starring Irene Wan (溫碧霞) and Becky Lam (林碧琪). 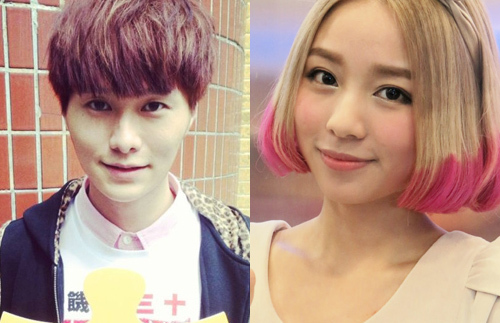 The 2013 adaptation stars a string of young Hong Kong idol artists including Heidi, Rainky Wai (蔚雨芯), rookie actress Kabby Hui (許雅婷), andBro5 member Dominic Lam (何浩文). Original cast members, Irene Wan and Mak Tak Woh (麥德和), will also star. Irene will also be producing the film. 5 comments to Hubert Wu is Pursuing Two Super Girls? As Hins is going to sign with EEG, the parody of brokeback will come back to him soon as both of Kenny and Hubert are in EEG. Hubert will turn to EEG next year. Why does he always dress like a grandpa?